The black and yellow garden spider is a special creation of the God of the Bible. 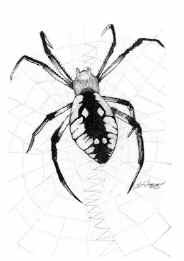 As does each species of spider, it has its own unique web, which may be spun more than two feet in diameter. At the center of the web, the spider makes a dense area of silk that often gives the appearance of a zipper or zig-zag bulk of silk. The female weaves an egg-sac that is pear-shaped and about one inch in diameter. She then hangs the egg sac somewhere close to her main web. "This spider lays all her eggs at once. There are usually 40 or 50. As each egg is expelled the female dusts it with a powdery substance. This dusting gives the egg a coating that looks like the bloom on a plum or a grape. Shortly after the eggs are laid they hatch. The young are known as spiderlings. They break out of the shells by means of an organ known as the "egg tooth". This later disappears." The black and yellow garden spider is like a miniature manufacturing plant. It produces different kinds of webbing in more than one color for different purposes, as well as making the powdery substance with which it coats its eggs. Some of its webbing is sticky to entrap insects for food. Other parts of the web are not sticky, enabling the spider to move rapidly across the web without ensnaring itself. How does evolution (the impersonal plus time plus chance) explain the complicated ability of one spider to produce different types of webbing for different purposes and even in different colors (varying from white to brown)? And how does evolution explain the presence of an "egg tooth" in a baby spider? "To reach new locations the spider travels by a means of transportation known as "ballooning". A spiderling or spider throws out streams of silk. These threads form a sort of "flying carpet." It rises on warm currents of ascending air, and spiders and spiderlings are borne aloft and scattered far and wide. Sometimes they go as high as 14,000 to 15,000 feet and travel hundreds or even thousands of miles." The skin moults and splits open in a special manner. First, the spider injects a certain liquid called "moulting fluid" between his outer old skin and his newly developing skin. Where does this special fluid come from, and how does the spider know what to do with it and when to use it? Using the moulting fluid too soon or too late is fatal! "Once the old skin is sufficiently loose, splits appear along the sides of the body and in front of the eyes. But no horizontal split occurs across the body. The vertical split along each side of the body and the one crosswise in front of the eyes form a flap of skin. The spider pushes up the flap like a man thrusting up a hinged trap door. It pushes and pushes and pushes until the flap drops back over the abdomen. Out of the opening wriggles the spider." What infinite care our Creator-God has taken in the design of the spider! This little creature breaks the rules of the evolution model with its marvelous complexity. It needed God to create it just like it is with all its abilities and peculiarities. The black and yellow garden spider is a marvel of God's creation -- the God for whom nothing is impossible (see Luke 1:37), and who daily lives to make intercession for us (Romans 8:34) and who loves us so much that He willingly gave His life for us (John 3:16). Will Barker, Winter-Sleeping Wildlife (New York: Harper and Row, Pubs., 1958), pp. 94-96. Ibid: Will Barker, p. 96. Ibid: Will Barker, p. 97.